Register Here. Intimate Seminars to help Women gain Biblical truths, tools, & strategies in areas where they feel stuck. 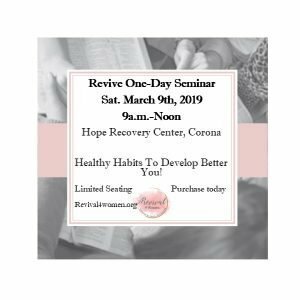 Revive Seminars is to empower the personal & spiritual life of women. Each seminar will be an intimate setting focused on a relevant issue women are facing today. Women will gain applicable truths and strategies, spend real moments through journaling/ praying, and sharing life experiences with a safe community of women. We have discovered it can be safer to share our struggles, hurdles & obstacles with women who are not part of our everyday community (church, business, etc.) Our goal is for each woman to grab on to some new truths that will move her in a direction of Increase & Revival. SEMINAR FOR WOMEN OF ALL AGES!! Session #2: Developing Goals for the Single, Married, & Family to Accomplish Dreams and Passions.